This quick appetizer is tasty and a healthier version than the deep fried ones. 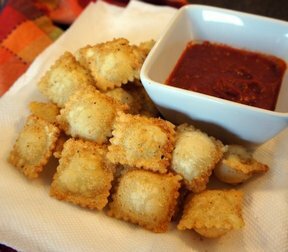 Kids will enjoy helping you "batter" up the raviolis. In bowl, combine bread crumbs and cheese. In another bowl, combine sour cream and milk. 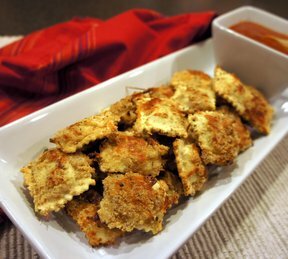 Coat ravioli one at a time in the sour cream mixture, then in bread crumbs. Place on nonstick baking sheet. Bake until lightly browned, around 14 minutes. 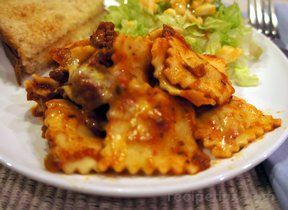 "Not quite as tasty as the ones I get at my favorite restaurant, but they were good for being baked and so easy to make. You have to have the marinara sauce to dip them in."